The picture above is my niche. I keep this wooden block on the window sill at my office right behind my laptop. Even when I'm working, I can usually see the top peeking above my computer screen. It's a nice reminder of what I learned on this project and what I'm still learning. 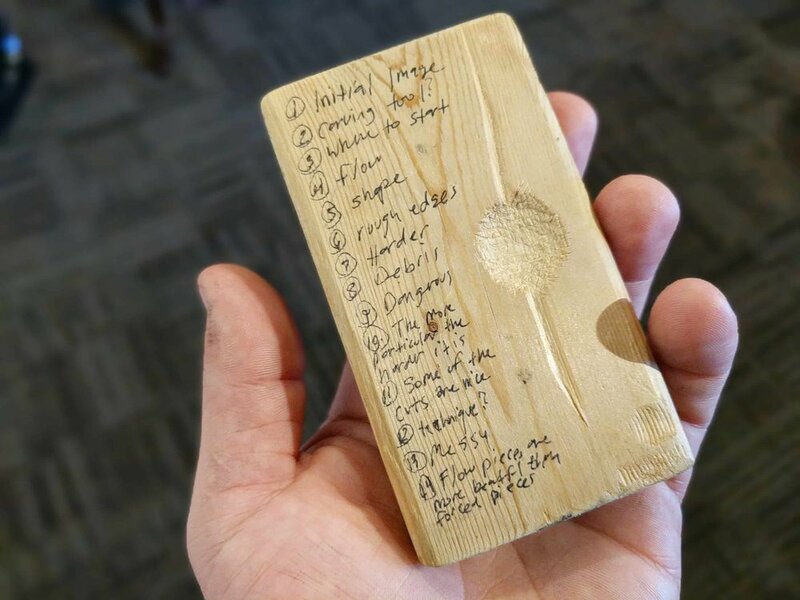 One morning about ten months ago as I was getting ready for a meeting, I noticed one of my son's wooden blocks I had made for him the year before. I intuitively grabbed it on my way out the door with the concept of "niche" lingering in my mind. I remember flipping the block through my hand as I was driving to my destination that morning. I got to my meeting early and had about twenty minutes before I needed to get out of my truck. "I wonder what can I learn from this block of wood?" I grabbed a pocket knife and decided to find out. I carved until I needed to go in for my meeting (I almost lost track of time). I dusted all of the shavings off my pants and out of my seat and walked inside while holding the block with my thumb resting and rubbing the textured indention. It was nicer to the touch than expected. When I got out of the elevator, I noticed I was the first one there. So naturally, I got out my pocket knife and went back to work (more delicately and cleanly to not make a mess). This is where the longer and curved lines following the grain happened. Eventually, someone got there and asked what I was doing and I told them I was carving out a niche as if it were a normal thing to do in a waiting room. They didn't seem to think much of it. I kept working until it seemed good-enough. During the process of carving, I started to make small notes of what I was learning on the block next to the carving. What I wrote on the block is in parentheses below. What follows that is my reflection. (Initial Image) I had an initial image of what it would look like. I imagined how a carving tool would respond to the wood. This was quite different than it turned out. (Carving tool?) What should I use to carve it? There are many tools, but which ones are best suited for this particular niche? How will this impact the final product and the amount of work it will take? I ended up using what was available at the time, a pocket knife. I didn't know at the time how much impact this would have on the final outcome due to the limitations of the tool. Had I been more insistent on my vision, I would have chosen a more appropriate tool to carve with. In the end, it would have taken less time, been easier, and would have been closer to my initial vision of what I wanted. (Where to start) Where do I start? This sounds like a simple question but it's not. I could start anywhere. My initial vision did not incorporate a specific placement. I ended up starting where it was easiest to both hold and to carve. This could be good or bad. It could be good because it made it easier, safer, and more practical and because some details work themselves out in time. It could be bad that it's less specific and placates to ease and comfort rather than serving the original vision or idea. (Flow) There is an unexpected flow. It's hard to go against it. It comes from the natural grain of the wood. It's not as obvious the impact this will have when holding a smooth block of wood. The knife had a hard time resisting the natural grain of the wood. I'd try to go one way, the knife would find the grain and try to go with it. In hindsight I liked this because it allowed the material to influence me. No relationship is one way. There are rules and principles that govern everything on some level. They have to be respected at minimum, and appreciated and honored at best. Do I think so highly of my idea and force of will that I cannot allow any influence of the material I'm interacting with? (Shape) What shape should it be? Again, so many options as I began to carve. Once I started to carve and notice to what the wood was doing I began to have more specific ideas of the form it could take based on the knife I was using. How much do I want to struggle versus allow it to me a more natural process? I decided to let it be more natural and go with the flow. I was becoming curious what would happen if I allowed myself to be influenced by what was taking shape and responding to the present shape than my original vision. (Rough Edges) There are lots or rough edges! It wasn't near as smooth as I first imagined. (Harder) It's harder than it looks. Maybe it was the wood? Maybe it was the knife? Maybe it was my skill level? Regardless, it was more work than I imagined. (Debris) The debris went everywhere. There were little pieces of wood all over me. Every now and then, one of those pieces would fly several feet away. I wasn't ever going to be able to find them, use them again, or put them back. (Dangerous) I'm surprised I didn't get cut. The pocket knife was a "gentleman's" pocket knife. They are generally very thin blades and not very wide. I often had to hold the blade to make the cut I wanted. The knife was not as sharp as it should have been and yellow pine is not known for being a particularly soft and cooperative material for carving. (The more particular, the harder it is) The more I wanted it to look a certain way, the harder it was and the longer it took. As it was taking shape, I really had to weigh the pros and cons of exacting my vision or flowing with the grain of the wood. This was never an easy thing to decide. (Some of the cuts are nice) This wasn't obvious at first. At first, everything was a tiny chunk of struggle and clunk. However, as it began to take shape I started accepting and respecting the natural grain of the wood and enjoyed the look of the marks I was making. (Technique?) I started to notice that the look was very dependent on how I used the knife. Everything was dependent on the angle, pressure, and direction. Technique was inescapable. Every few minutes I would have to change it up because my hand was hurting or I wanted to cut with the grain or against it. The longer I carved, the better I got at knowing when each technique was appropriate. (Messy) Did I mention is was messy? Who would have thought that this tiny niche in this tiny block of wood could make such a mess? Not me! I think it had something to do with the way I was carving. I started to do a cross-hatching technique that created particles that were more like dust than wood. When I wiped my pants, it rubbed into the material rather than off it. (Flow pieces are more beautiful than forced pieces) The forced cuts are the ones that ended up turning into sawdust and staining my clothes. The forced cuts and consequent pieces felt and looked unnatural. It wasn't as enjoyable and felt like I was forcing my will on a medium that was better suited for a different kind of interaction. At some point I began to notice the grain and pointed the edge of my knife between the grain, into the soft part, and let the knife glide. These cuts were long flowing pieces that curled up in a spiral. This was the most enjoyable part. When I was appreciating and responding to the process for what it was in the moment it was both aesthetically pleasing, smooth, and left beautiful artifacts. In the end, one thing is crystal clear. The learnings here go beyond carving a niche, both literally and figuratively.